Sony VPL-HW40ES Full HD 3D Home Cinema Projector is a fantastic option for movie lovers who want an incredible cinematic experience at home, far beyond the reach of TV. It is packed with professional technology, including advanced SXRD panels and Reality Creation for an incredibly sharp, crystal clear picture. With 1700 lumens colour brightness, you can enjoy your favourite films at their best, in 3D or 2D. Bright Cinema and Bright TV modes also ensure optimum brightness and superb, rich colour quality. Thanks to an improved optical engine, the VPL-HW40ES is much brighter than our previous standard home theater projectors. At 1,700 lumens, it produces clearer images and faithful colors, even in well-lit rooms. Developed for the Sony 4K home theater projector, this function has now been adapted for the new VPL-HW40ES projector. It reproduces the texture and color of the original 1080p signal by restoring missing information lost during packaging of the original contents to disk and broadcast transmission. As a result, you can enjoy sharp and crisp full HD pictures. This function automatically adjusts the contrast for optimum viewing. It compensates for dark and bright parts of an image by analysing the signal component of each scene in real time to enhance contrast. Conventional home theater projectors typically enhance the green color to secure image brightness. However, the VPL-HW40ES boasts the new Bright Cinema and Bright TV Mode. With optical block and signal processing improvements bringing high brightness without a loss in color reproduction and contrast, you can enjoy bright, crisp images even when viewing in a well-lit room. You can synchronise the projector with the 3D glasses thanks to the 3D synchronous transmitter built into the front of the projector, thus reducing set-up time and removing the need for extra cabling. The VPL-HW40ES runs very quietly with an advanced air discharge system. Through a highly efficient cooling system, fan noise is suppressed to a mere 21dB. With whisper-quiet fan noise, you can concentrate on a movie or game in a quiet environment without distraction. Motionflow technology allows the VPL-HW40ES to display twice as many images per second. This algorithm, unique to Sony, creates completely new images based on the incoming signal, and inserts them between the original frames to reproduce smoother, sharper motion. produce an ultra-smooth picture by minimizing the space between pixels at a superfast speed. The VPL-HW40ES is synchronised with our 3D glasses for a jaw-dropping experience and minimal crosstalk. When each of the shutters on the 3D glasses opens, Dynamic Lamp Control Technology automatically boosts the brightness in the image to that eye, maximizing the picture’s impact and the lamp’s efficiency. This means that you will not lose any brightness, but instead attain an optimal visual experience from the comfort of your own home. The VPL-HW40ES allows you to pre-select separate parameters for 2D and 3D content under a variety of application modes – Dynamic, Standard, Game, Cinema and Photo – as well as automatically recognising 2D or 3D input. The VPL-HW40ES is configured with a function that compensates for gaps in character or color management. It is possible to select R (Red) or B (Blue) to make adjustments based on G (Green), and to adjust the horizontal and vertical direction by shifting the full image or selecting zones for each color. The VPL-HW40ES offers an RCP (Real Color Processing) function to adjust the color and hue of each target color of the projected picture independently. Additionally, version 2 adds the ability to adjust the brightness at the same time. With this capability, you can tweak the images to perfection. 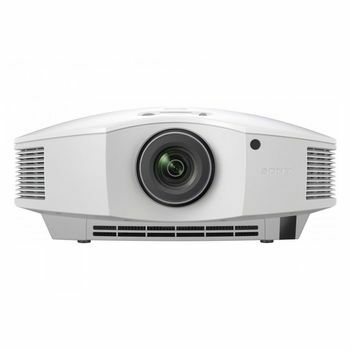 Sony VPL-HW40ES Full HD 3D Home Cinema Projector is a fantastic option for movie lovers who want an incredible cinematic experience at home, far beyond the reach of TV. It is packed with professional technology, including advanced SXRD panels and Reality Creation for an incredibly sharp, crystal clear picture. With 1700 lumens colour brightness, you can enjoy your favourite films at their best, in 3D or 2D. Bright Cinema and Bright TV modes also ensure optimum brightness and superb, rich colour quality. Well-balanced, High-brightness, High-grade Images Thanks to an improved optical engine, the VPL-HW40ES is much brighter than our previous standard home theater projectors. At 1,700 lumens, it produces clearer images and faithful colors, even in well-lit rooms. Reality Creation for Full HD Developed for the Sony 4K home theater projector, this function has now been adapted for the new VPL-HW40ES projector. It reproduces the texture and color of the original 1080p signal by restoring missing information lost during packaging of the original contents to disk and broadcast transmission. As a result, you can enjoy sharp and crisp full HD pictures. Dynamic Image with High ContrastContrast Enhancer This function automatically adjusts the contrast for optimum viewing. It compensates for dark and bright parts of an image by analysing the signal component of each scene in real time to enhance contrast. Bright Cinema and Bright TV Picture Modes Conventional home theater projectors typically enhance the green color to secure image brightness. However, the VPL-HW40ES boasts the new Bright Cinema and Bright TV Mode. With optical block and signal processing improvements bringing high brightness without a loss in color reproduction and contrast, you can enjoy bright, crisp images even when viewing in a well-lit room. Built-in 3D Sync Transmitter You can synchronise the projector with the 3D glasses thanks to the 3D synchronous transmitter built into the front of the projector, thus reducing set-up time and removing the need for extra cabling. Whisper-quiet Fan 21dB The VPL-HW40ES runs very quietly with an advanced air discharge system. Through a highly efficient cooling system, fan noise is suppressed to a mere 21dB. With whisper-quiet fan noise, you can concentrate on a movie or game in a quiet environment without distraction. Motionflow Motionflow technology allows the VPL-HW40ES to display twice as many images per second. This algorithm, unique to Sony, creates completely new images based on the incoming signal, and inserts them between the original frames to reproduce smoother, sharper motion. Advanced SXRD Panels produce an ultra-smooth picture by minimizing the space between pixels at a superfast speed. The VPL-HW40ES is synchronised with our 3D glasses for a jaw-dropping experience and minimal crosstalk. Dynamic Lamp Control Technology for 3D When each of the shutters on the 3D glasses opens, Dynamic Lamp Control Technology automatically boosts the brightness in the image to that eye, maximizing the picture’s impact and the lamp’s efficiency. This means that you will not lose any brightness, but instead attain an optimal visual experience from the comfort of your own home. Separate 2D and 3D Modes The VPL-HW40ES allows you to pre-select separate parameters for 2D and 3D content under a variety of application modes – Dynamic, Standard, Game, Cinema and Photo – as well as automatically recognising 2D or 3D input. Panel Alignment Function The VPL-HW40ES is configured with a function that compensates for gaps in character or color management. It is possible to select R (Red) or B (Blue) to make adjustments based on G (Green), and to adjust the horizontal and vertical direction by shifting the full image or selecting zones for each color. RCP (Real Color Processing) Version 2 The VPL-HW40ES offers an RCP (Real Color Processing) function to adjust the color and hue of each target color of the projected picture independently. Additionally, version 2 adds the ability to adjust the brightness at the same time. With this capability, you can tweak the images to perfection.